In cities around the world, tens of thousands of volunteers have been attempting to make sure that no one is forgotten at this time of the year. The volunteers are the unsung heroes who reach out to provide some Christmas cheer for the unfortunate and the disadvantaged. Often the volunteers give up precious time with their own families to give a helping hand. A project at the Church of Santa Maria in Trastevere in Rome is just one example of where hundreds of people have been provided with warmth and a Christmas dinner. Many of the people who volunteers help are migrants, the homeless and the poor. Najef Harbib, a Syrian refugee, had dinner in the Church of Santa Maria. "We came from Syria through Lebanon," he said. "We're refugees and we're a family, and today we're a family together with the Sant'Egidio charity, one big family." 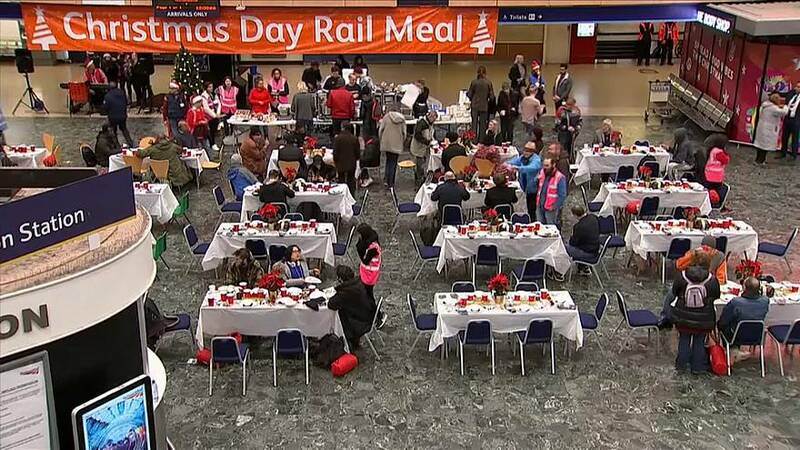 In another example, railway workers turned London's Euston Station into a dining room to provide Christmas dinner for about 200 homeless people. Steve Naybour, an organiser of the event and a Network Rail worker, said: "Somebody told me in the build up to this that some of the guests have expectations that aren't very much. "So when you do a small thing, then they really kind of welcome it. So this is quite a big thing. So, yeah, we'll get some nice reactions."